As I mentioned earlier my college is one of the best colleges of Gujarat. the good remark i can say that the college was very disciplined and well maintained the principal was also quite good who use to manage the college well and make the necessary decisions for the college.the bad remark was that from the students point of view was that there was a lot of groups and divsions among the students instead of evryone being as one big group..2ndly there werent any picnics organised by the college and lastly the college was very strict about the attendance for the students which some of them coudnt answer their exams which was quite bad. St.xaviers is the best college in goa with the goal of overall growth.here we learn n also enjoy.there are many rules but are really useful rules.we have many activities which is really very good. All in all, everything is quite good not absolutely perfect but good. St. Xavier’s College of Art, Science and Commerce is one of the pioneer institutes in Goa with an aim to shape the youth into balanced intellectual beings, who can stand independently and contribute for the betterment of society. This catholic institution has achieved its excellent academic standards in a span of last 50 years and is well-recognized by UGC and Goa University. This College has introduced an array of professional and academic programmes, in all streams, under graduate, post graduate and higher levels. This premier institute of Goa has made a mark in the hearts of its alumni and the state by its quality work and spiritual inspiration. 43 kms from Edapally Bus Stand. Local Conveyance can be used for local transit. Why to Join St. Xavier’s College of Art, Science and Commerce? 1. Committed and well trained Professors:The College is proud of its excellent faculties, who have helped the institution in achieving growth and glory. Their teaching techniques are advanced and help the students in attaining their goals. 2. 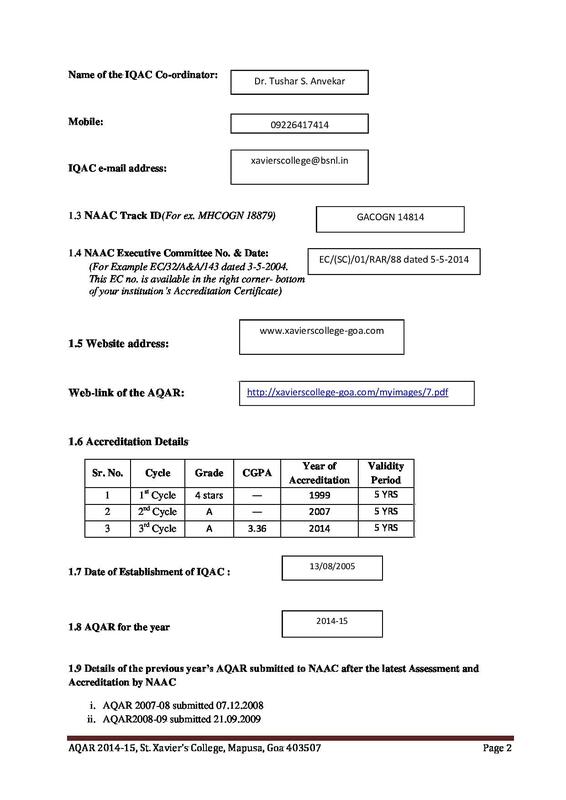 Awards and Acclaims:The Institute has been acclaimed by University of Goa as Best College in Goa, NAAC has recently re-accredited as A Grade College, UGC has declared it as ‘Centre of Potential Excellence’. Also, it has received the award of Best College in Sports. 3. First Class amenities and infrastructure: The College provides excellent amenities and equipped well in terms of infrastructural facilities. Well maintained library, Large Play Grounds, Auditorium & Theatre etc. attracts the students to take admission in the college. 4. 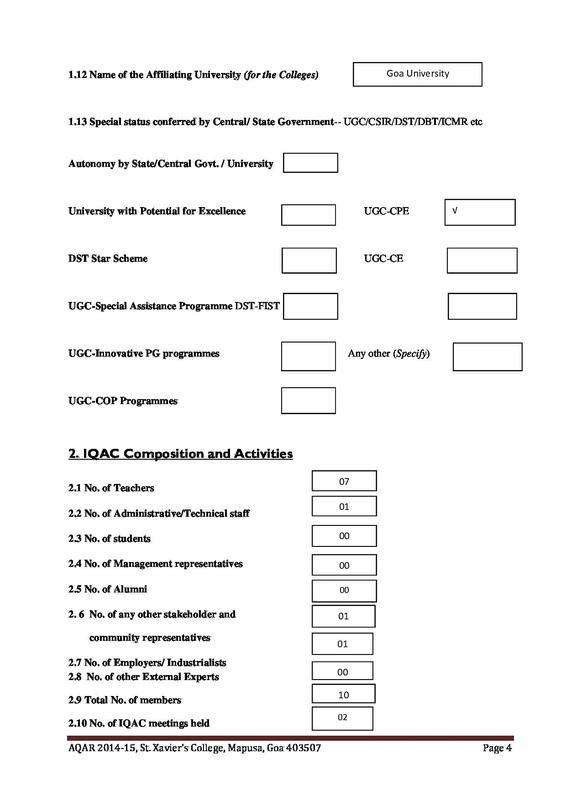 Extra Curricular Activities for complete development: The College provides numerous opportunities to entirely groom the personality and not to restrict them to Academics. Quite a number of Cells, Associations, clubs etc… are formed to benefit the students. 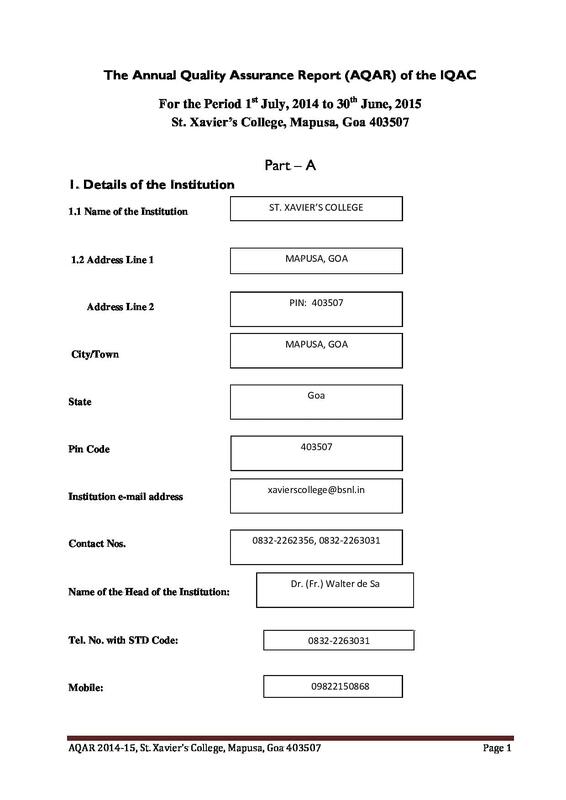 sir, i want to take admission in bsc-1 year[microbiology] in st.xavier's college mapusa goa. how and when i apply for admission in this college in 2017-18. plz. tell me about fee structure for admission and about hostel facility. 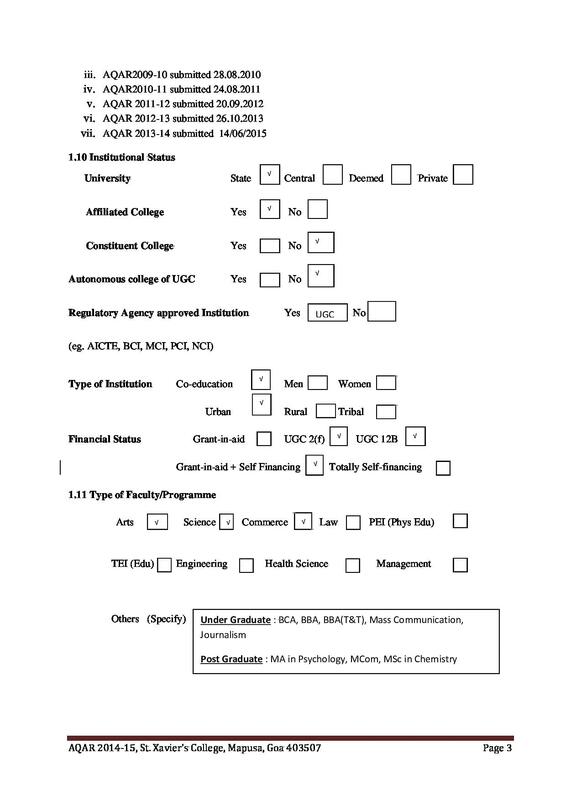 None all I had to do was get through the general board examinations and apply as for why I chose the course, it had better subject choices, those that I prefer - Psychology.